In contrast, the MGC cover, produced a few months after Kirby's departure from Marvel, dispenses with the mystery aspect of the FF travelling to another world, and instead bringing the FF front and center and putting them right in the middle of the action. Yet in "Behold! A Distant Star! 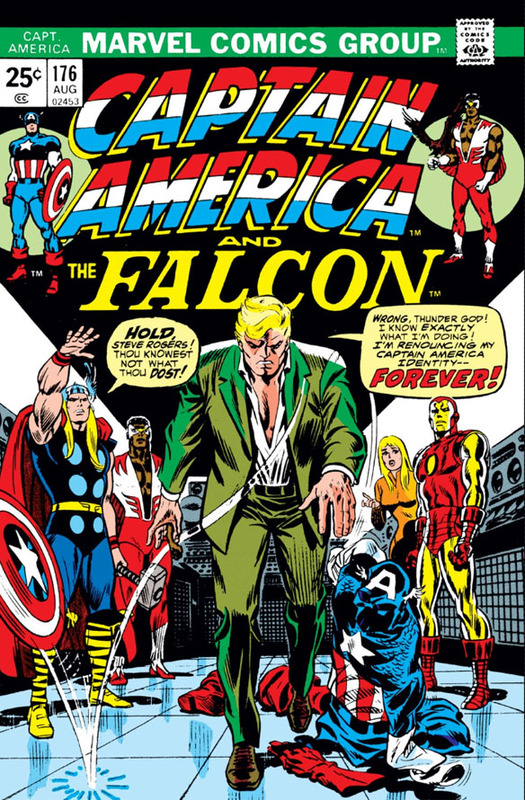 ", a title resonating with adventure and discovery, Kirby succeeds in providing a story that is all a writer could hope for to script, a grim adventure that turns into a deadly outing for the FF. Its title caption certainly ups the stakes for a team which had, in 1965, become like a second family to its readership: "The Fabulous FF Actually Invade Another Galaxy!" 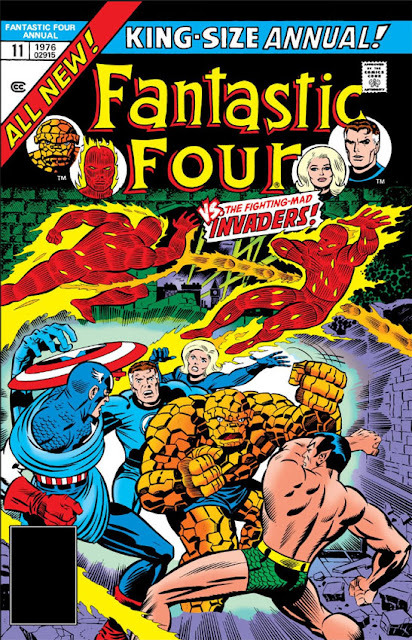 At the time, that seemed a little far-fetched, even when we're talking about the Fantastic Four; but over time, this mission would help to establish an eerie pattern of behavior for the group. 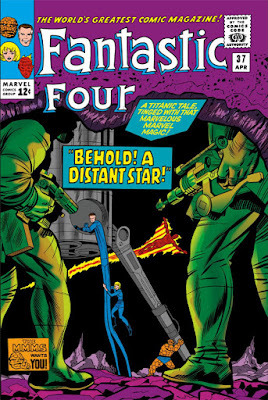 For example, the FF would one day invade Sub-Atomica on what became a mission of revenge for the Invisible Girl; and earlier, they also invaded the Negative Zone and seized a device from Annihilus in order to help Sue's chances of surviving her child's birth. And it's the Invisible Girl here who starts the FF down the road of invading other worlds, when she seeks justice on behalf of her father, murdered by the Skrulls. 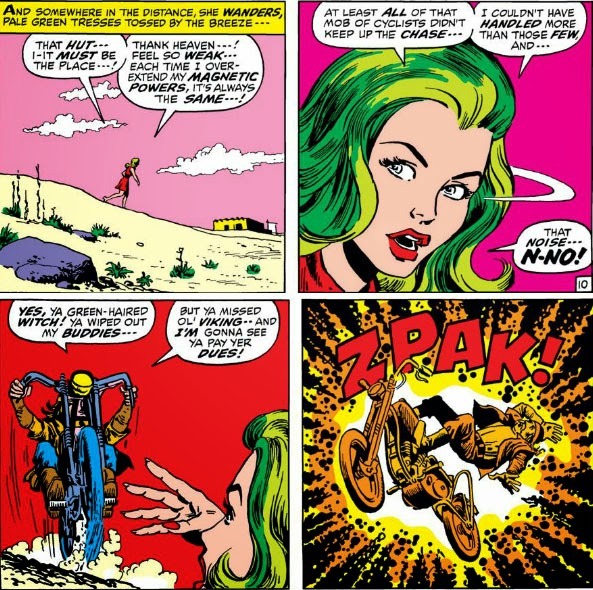 Jeez--instead of flowers, maybe Reed should have brought this woman an assault rifle! But this issue of The Avengers offers a little more than just the standard changing of the guard--perhaps a little too much more, since it virtually buries the reader in procedural details that go beyond the simple motions and nominations and the "yea" or "nay" vote that usually comprise these new-lineup issues. It makes for an interesting change, though you find yourself wondering how the Avengers--most of whom would probably prefer fighting the hordes of Hydra over coming to agreement over subsections and rules--get anything done when there's enough of them to fill an entire chamber to debate an issue back and forth. Part of the reason for all the trouble here has to do with a shocking announcement given by Raymond Sikorski, the team's liaison to the National Security Council, during a recent crisis. It's something of a misstatement on Sikorsky's part, since the NSC has no authority to actually cancel the Avengers' charter itself. 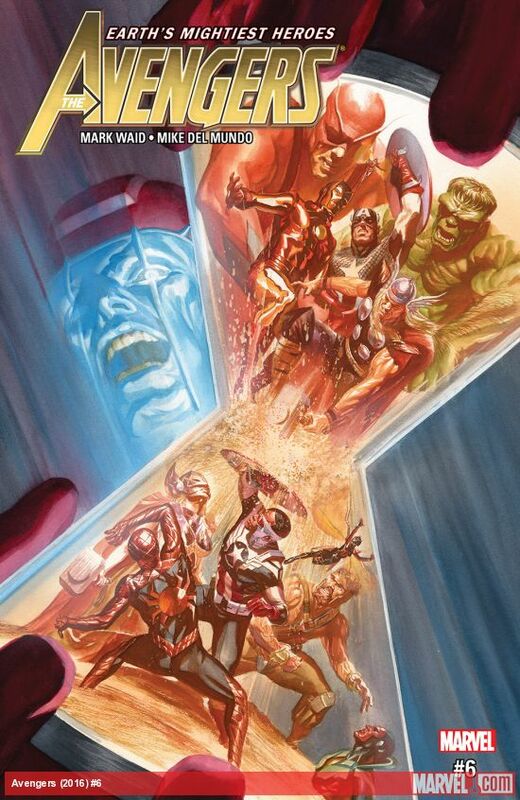 They can do the next best thing, and revoke the team's government security clearance, effectively crippling Avengers operations; and they can disband the team due to a breach in national security, a condition that doesn't apply in this case. 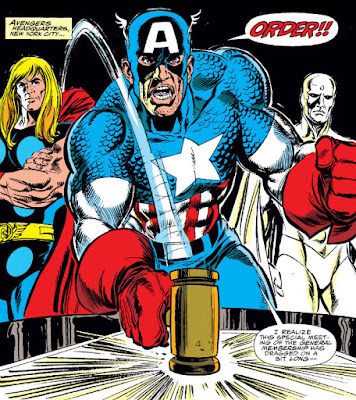 But the charter simply acknowledges the Avengers' ties to government agencies--in no way does it cede authority to the government to rip it to shreds, figuratively or otherwise. 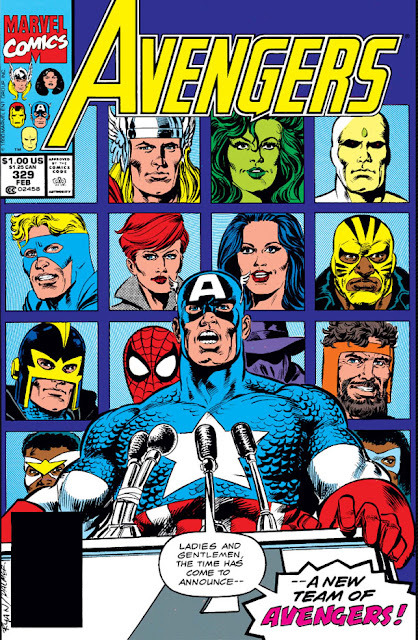 Yet true to his word, Cap works hard behind the scenes to restore the Avengers to full operating capacity and return them to their status as a fighting force with official ties--and this issue is mostly about putting the Avengers back on track and reaffirming their commitment to the public. 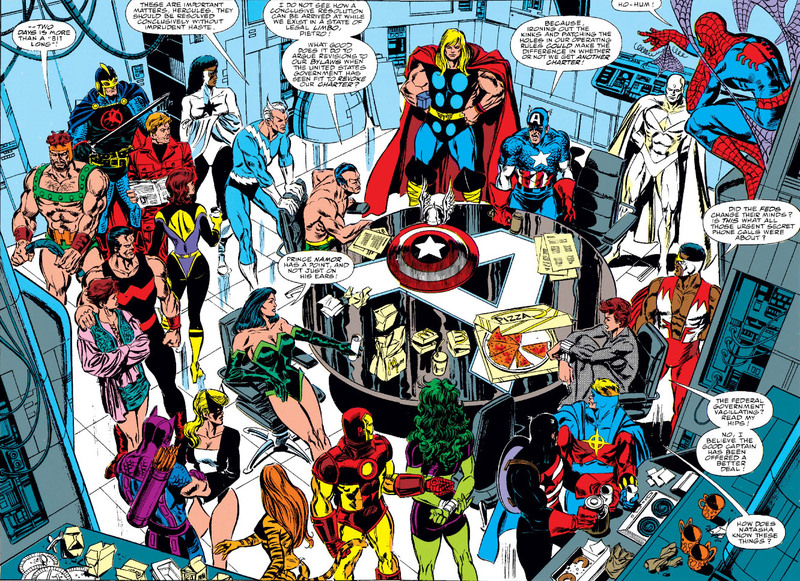 And so, after a lengthy forty-eight hours of deliberations, and no doubt a few frayed nerves, the Avengers are at last on the cusp of putting their house in order and greeting their public once more as a force united--and, yes, that includes a brand new lineup and making the announcement in front of their newly-built headquarters, as well. 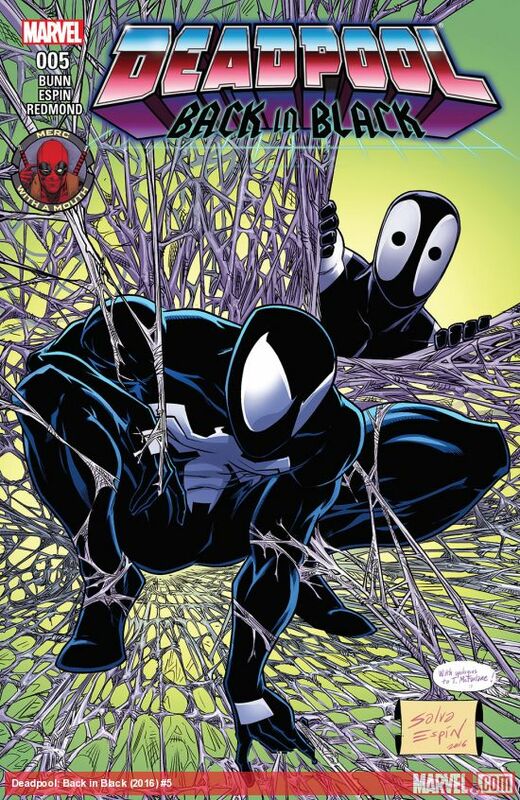 Which of these heroes will make the cut? Would you believe, in one way or another, most of them? Back in the '60s and '70s, man, motorcycle gangs had a certain reputation for intimidation and looking for trouble. 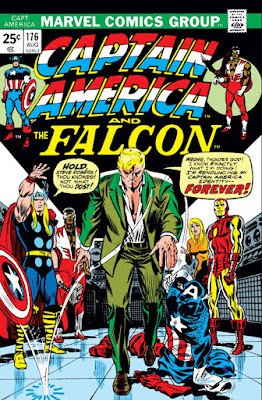 But you almost had to admire them for having the stones to mix it up with the likes of these guys. 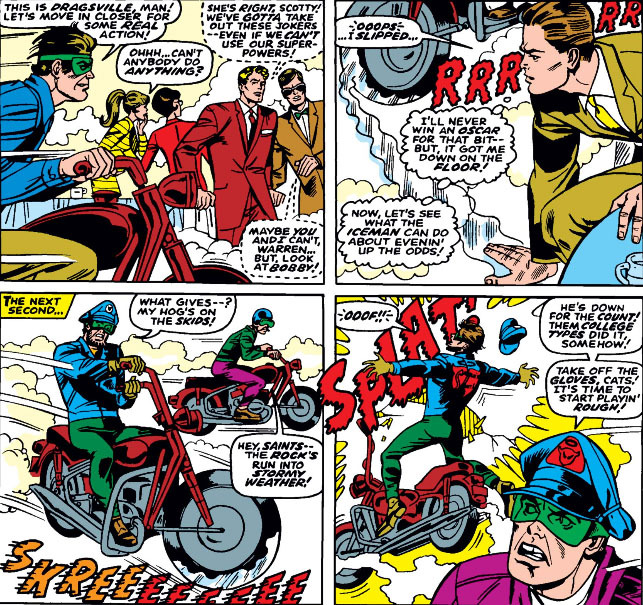 Even before the Ghost Rider made the scene, Marvel characters were crossing paths with motorcyclists who didn't think twice about taking on a cornball in a far-out costume. Let's take a brief look and see how that generally worked out for them, eh? 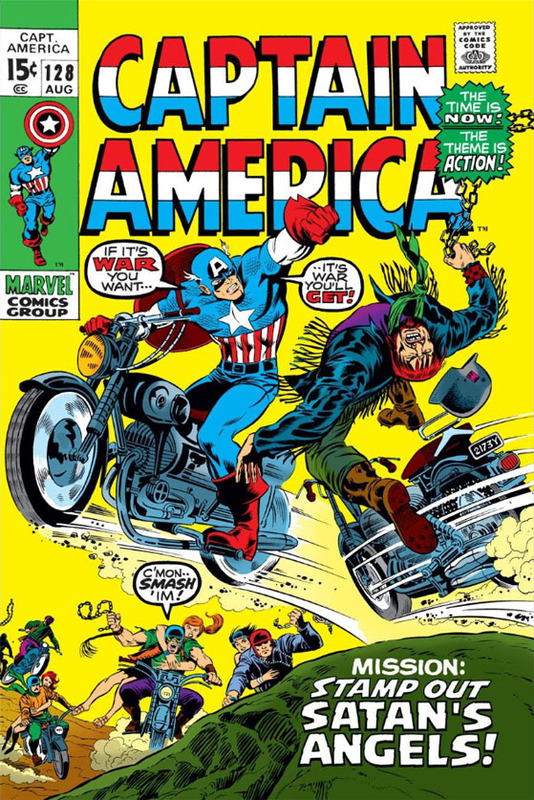 We might as well start with Captain America--but what's his beef with motorcycle gangs? He can get along with practically anyone, even scruffy cyclists. 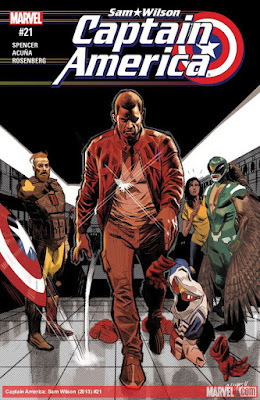 For instance, we know he's in tight with Team America, a group he met doing a charity gig and later joined forces with to take on the mad Thinker. But it seems even motorcyclists need a shield to the head when they get out of line. 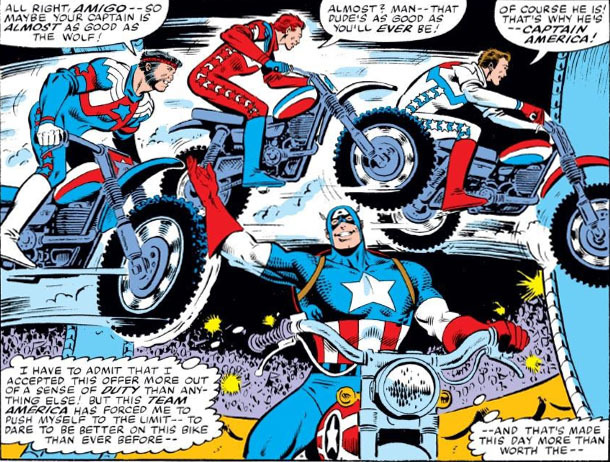 When Cap started riding his first cycle (that is, his first since his post-war days), he broke it in by taking on the Satan's Angels gang, who were giving some local kids some grief until Cap VROOOMMed to the rescue. 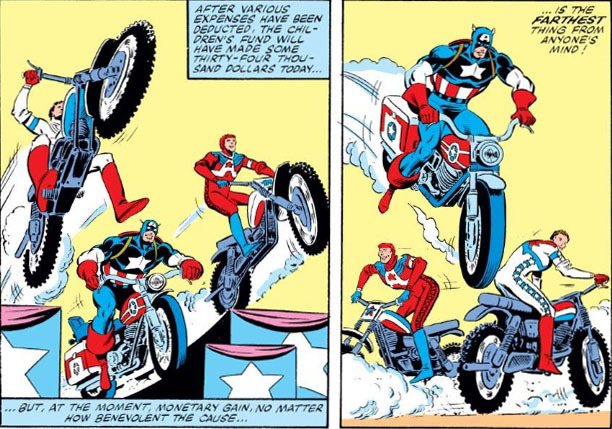 And unlike his foes, we know that Cap has a way of inspiring those he's trying to protect--so it isn't long before the kids get tired of staying on the sidelines and leap in to give him a hand. 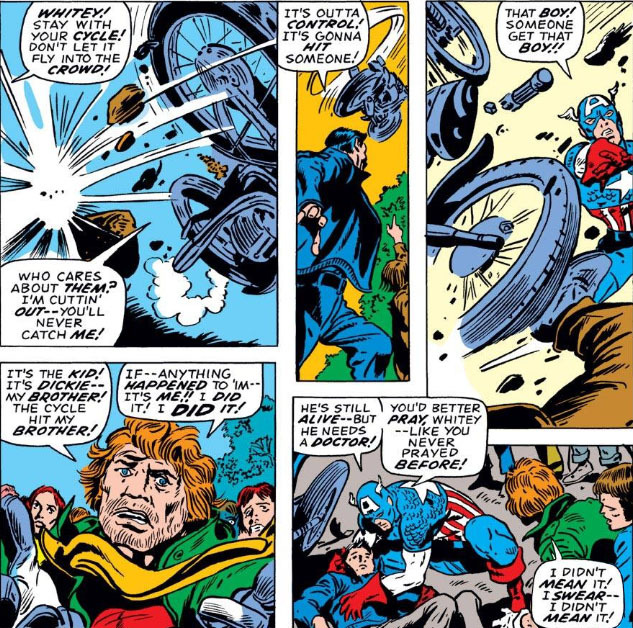 Unfortunately, tragedy strikes, when one of the cyclists who tries to bolt is responsible for his brother getting injured, which earns him an earful from Cap. Another gang, however, doesn't get off so easy. When you cross paths with Dracula, you learn that your rash actions carry consequences--for YOU, that is. 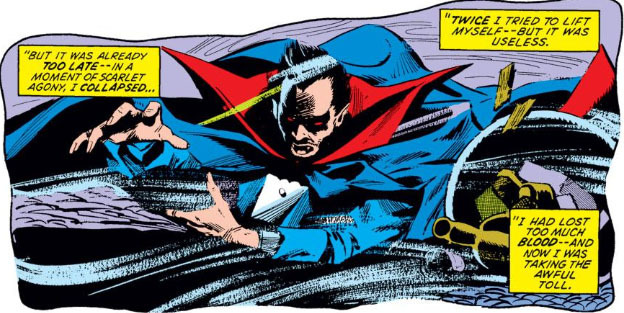 It was easy enough to get the drop on Dracula when he was weak from blood loss--with his attackers treating him no differently than anyone else who was ripe to be victimized, and later making sure that their victim wouldn't be around to identify them. Of course, Dracula's pride would have him narrate a slightly different version of what happened. But the tables would turn for our cyclists when Dracula finally caught up with them and exacted his revenge. And suddenly, gunning their bikes' engines carried a more terrifying portent for our young hooligans. San Francisco's Hellbirds turned out to be pretty rough on the streets even without their motorcycles--assuming these guys had any. 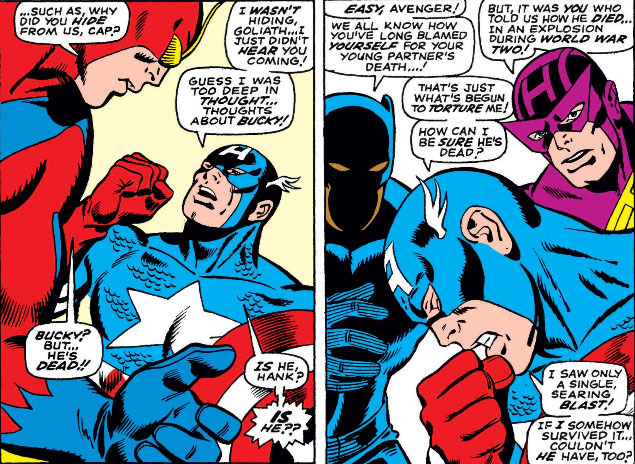 Either way, it wouldn't make any difference to the one and only Hawkeye. 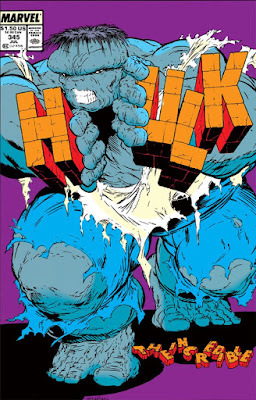 And what about going up against the Hulk? 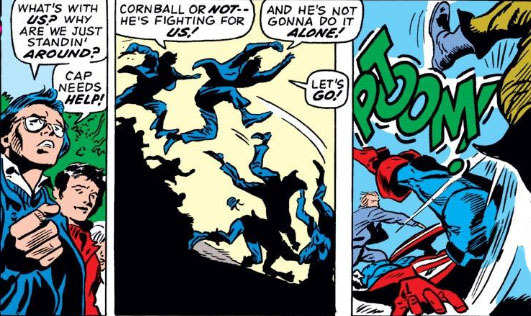 Isn't that a little suicidal, even for a motorcycle gang that collectively snarls in the face of danger? 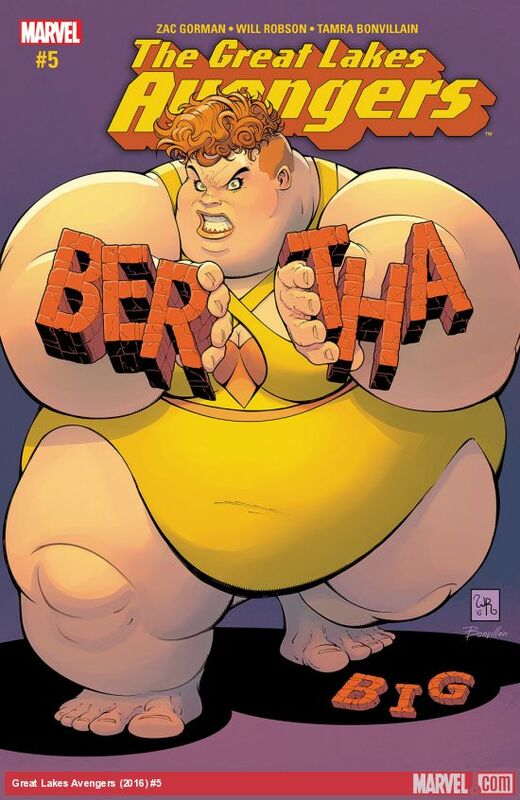 Gentlemen, you haven't seen snarling. 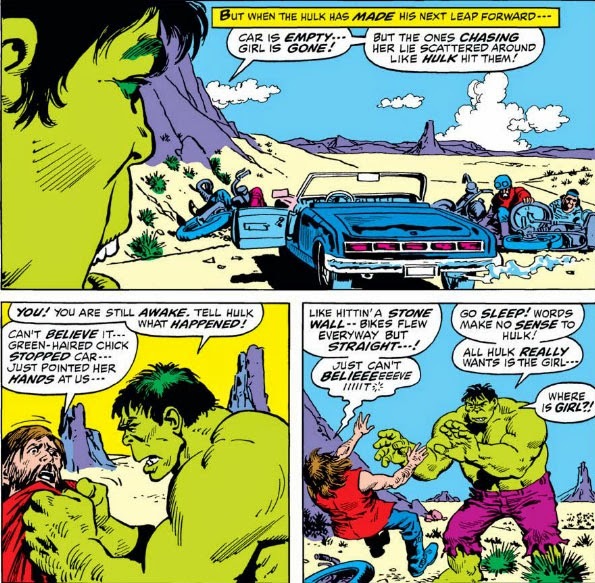 The lady in the convertible is Lorna Dane, formerly one of the X-Men, who was out in the desert on her way to see Alex Summers (a/k/a Havok), who was isolating himself in order to keep from losing control of his deadly power and possibly injuring someone. As for the Hulk, he spotted Lorna's hair from one of his prodigious leaps, and assumed that his beloved Jarella was being threatened by our less-than-friendly gang members. 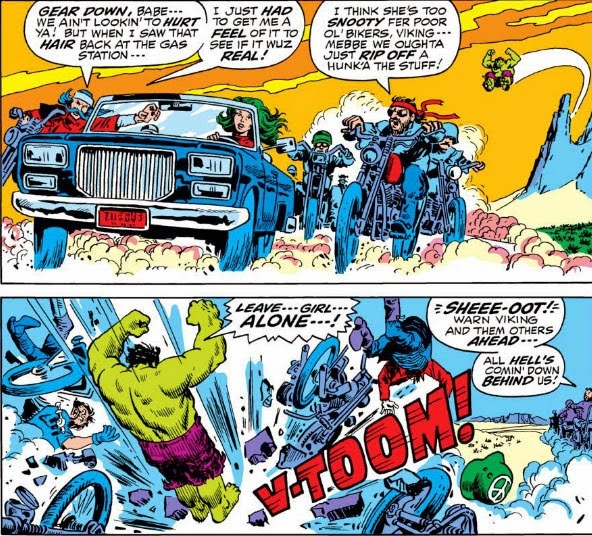 Once the Hulk catches up to the car, it looks like Lorna has dealt with her other attackers--but these bikers don't just look the other way when you mess with them, and one of them who has survived both attacks comes looking for a little payback. This just isn't Viking's and his buddies' day, is it. 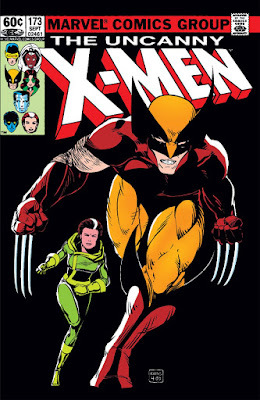 Speaking of the X-Men, what does a group of students have to do to find a little spot in town for a surprise party when their Prof wants to be alone to experiment on his step-brother, the Juggernaut? 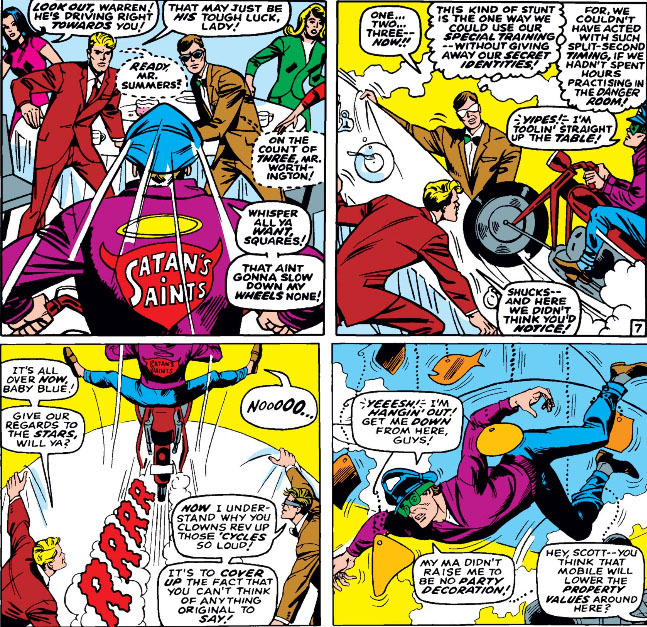 Apparently the place to be isn't the Coffee-A-Go-Go, where Satan's Saints (probably related to Satan's Angels--maybe there's a Satan cyclist franchise) decide to cause a ruckus, and instead get blindsided by a surprisingly well-trained group of teens. It looks like the reason the Saints are crashing the party here is all because their leader, Rocky Rhodes (heh, get it?) tried to hook up with Bobby Drake's date, Zelda, and was told to hit the rhode... er, road. Jeez, did the Saints ever pick the wrong time to make like tough guys. 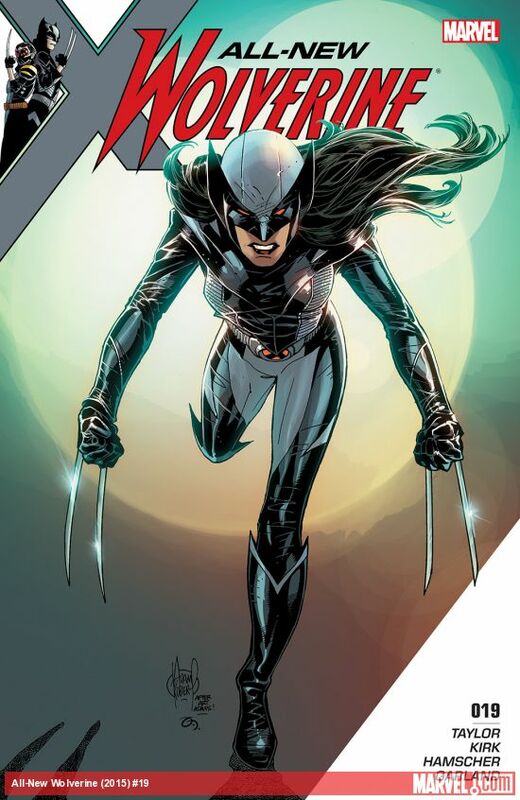 All's well for the X-Men, it looks like. Not so much for the Saints, on their way to police lockup--their reputation as tough guys pretty much in the can. By the way, Rocky, Zelda's really not into you now. "I did seek to ally myself with one as tempestuous, as regal, as I myself must be! I was in error!" 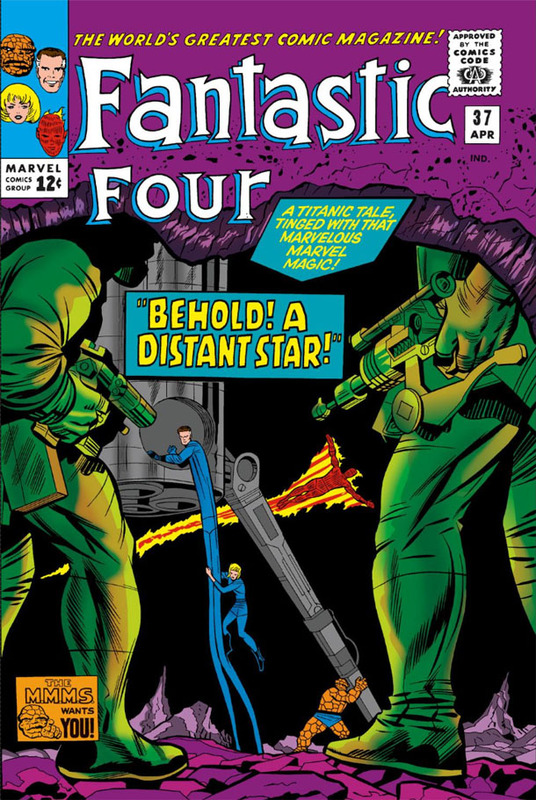 While it's easy to look in writer Roy Thomas's direction for pushing the pairing of Dr. Doom and the Sub-Mariner on readers, we'd technically have to regard Stan Lee as that idea's catalyst, since he had the two (briefly) joining forces in one of the earliest issues of Fantastic Four--a teaming which didn't work out, and certainly didn't leave us with the impression of long-term prospects with these two. 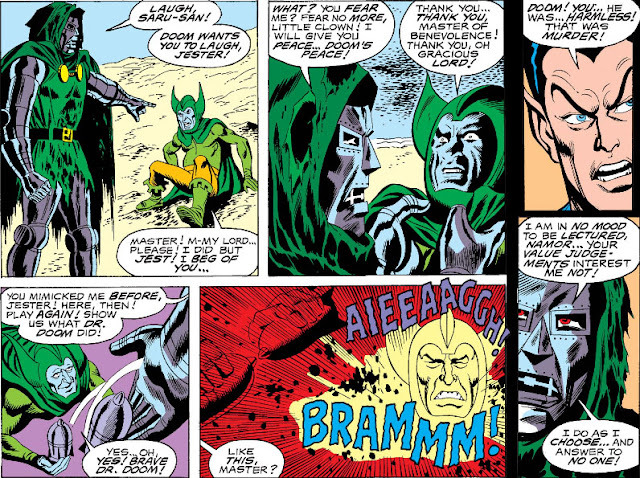 (Lee would also have Namor attempt an alliance with the Hulk once or twice, with similar results.) 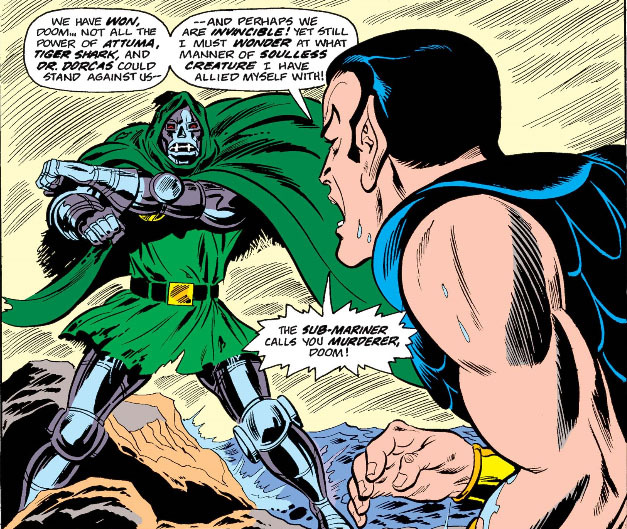 In their respective proposals of alliance to each other, both Doom and Namor would have instances where each was either certain that an alliance would be beneficial, or certain that it shouldn't be pursued. Given that the two often couldn't make up their minds in this regard, it's no surprise that their alliances never went the distance. 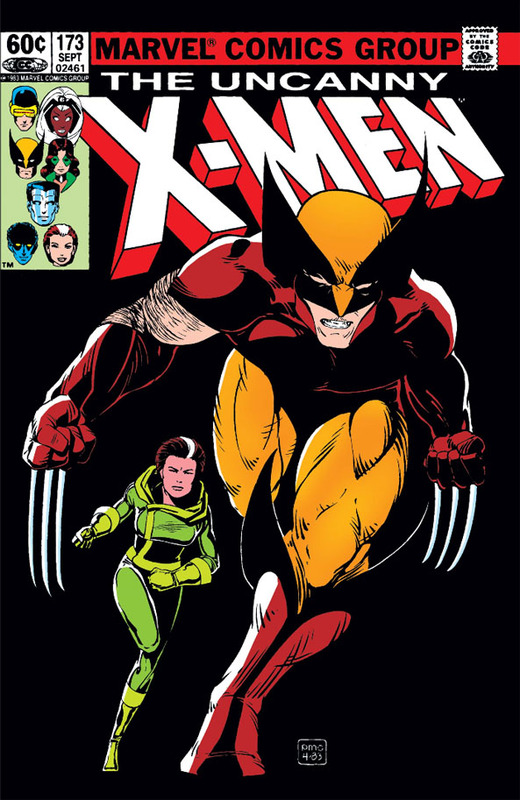 That was never more clear than in the Super-Villain Team-Up series that Thomas set in motion, with stories which saw Doom and Namor exist in a rocky relationship with each other, their "alliance" never truly on firm footing. Given that they rarely if ever saw eye to eye, the problem with their association was probably rooted in the type of alliance that they sought to form. Not all alliances share a mutual agenda; many simply involve general cooperation for specific purposes. In the case of Latveria and Atlantis (assuming we're talking about nations rather than individuals), one might come to the aid of the other in the defense of their borders or some other crisis, or pursuing diplomatic matters or goals requiring a united front. Doom offering to assist in the revival of the comatose Atlanteans (due to exposure to a deadly nerve gas) is a perfect example--though Doom would hold that over Namor's head for quite awhile before finally delivering on his promise. 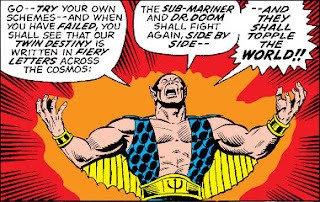 Yet the alliance sought by both Doom and Namor was originally envisioned as their joining together in conquest--a course which was usually only embraced by Namor when he felt wronged, whereas for Doom it was a singular and constant pursuit. There was also the matter of each of these men being proud rulers in their own right, whose goals were as much in conflict as their regal temperaments. 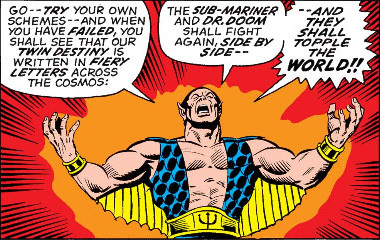 So it came as no surprise that, by this series' fourth issue, their formal alliance was on the verge of collapse--and it took only one incident to make Namor realize that this despot was unsuitable as an ally. The turning point comes after Doom has joined Namor to defend Hydrobase, where a group of amphibians in Namor's charge had settled but which had been invaded by the forces of Attuma and joined by Tiger Shark and Dr. Dorcas. 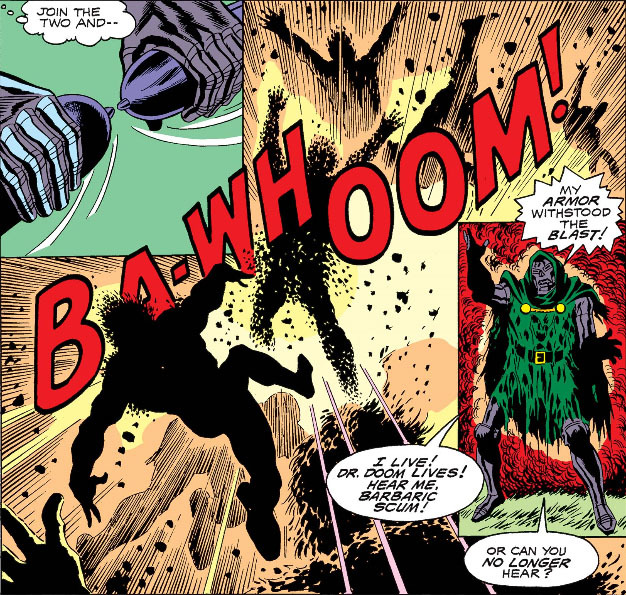 Doom, set upon by a group of Attuma's barbarians, responds with deadly force--and in his lingering rage, decides to make an example of Attuma's court jester. Namor, shocked at such callous cruelty, minces no words with Doom regarding his behavior--and the confrontation between them leads to a savage battle that makes it clear that these two have finally had it with each other. 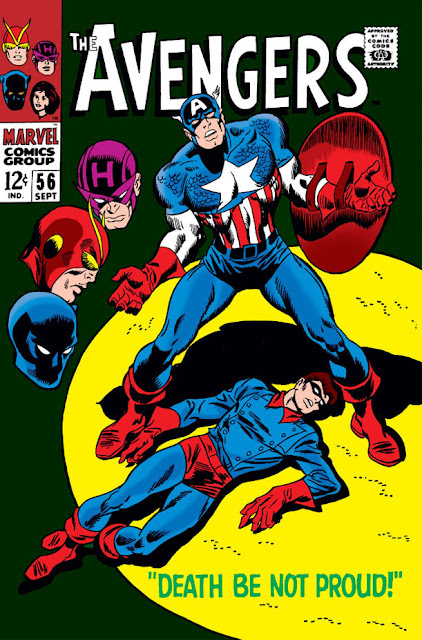 One of the most intriguing classic Avengers stories mostly serves as a lead-in to the 1968 Avengers Annual, but its premise has an irresistible hook that allows it to be a compelling tale in its own right--the possibility that Bucky Barnes, the young partner of Captain America, somehow survived the blast that killed him and is still alive. 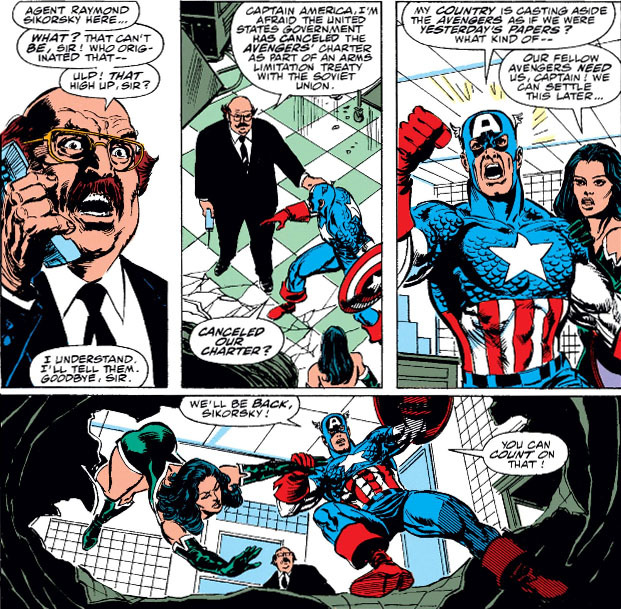 Or so believes Cap, who summons the Avengers to the vacant (and presumably stateside) castle of Dr. Doom to investigate a recent gnawing suspicion* that's been tormenting the star-spangled Avenger. *One of many seeds planted throughout the story which ties in with the subsequent Annual. That darn time machine again! 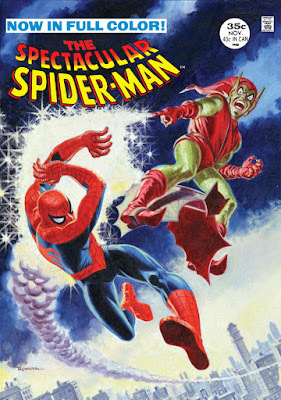 We've already seen writer Roy Thomas make it the focal point of three separate but linked-together stories involving the Thing (along with his three partners) and the heroes of World War II--and when all the dust had settled, he'd made such a convoluted jumble of the concepts of alternate realities and time continuums (which would become the basis for his upcoming What If series) that even Reed Richards had no interest in pursuing the matter. 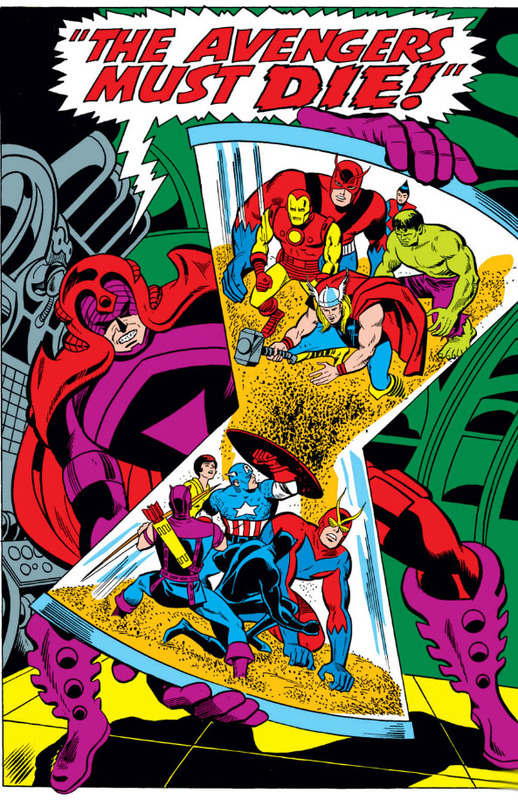 In this story, nearly a decade earlier, Thomas begins the process of using Doom's time machine to add dimension to past tales using the heroes of the present--and artist John Buscema provides him with one heck of a cover that was sure to turn a head or two at the comics racks. Not many of Marvel's comics published during 1976 made mention of the bicentennial celebration with more than a passing reference, but the company made a decent effort to incorporate the event into stories featured in Doctor Strange, Spidey Super Stories--and, it goes without saying, Captain America, not only in his regular title but also a special Marvel Treasury Edition devoted to the subject. By extension, another story featuring Cap would be one of those which at least acknowledged the event but went on to tell its own story, which really wasn't all that relevant but hearkened back to a memorable period of American history all the same. "And Now Then--The Invaders!" 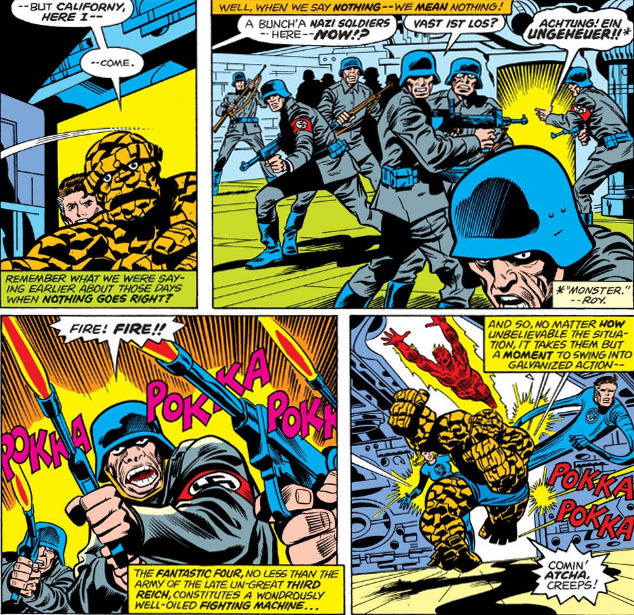 in the 1976 Fantastic Four Annual no doubt carried the stamp of patriotism with the presence of the Invaders, a heroic team of classic characters from comics' Golden Age--yet there is no real connection to the bicentennial, since the core of the story focuses on World War II and not the Revolutionary War. 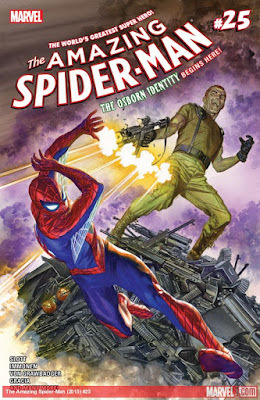 But you'll still be able to get into the spirit in this tale written by Roy Thomas, with its foundation consisting of a chilling premise of the Nazis having won the war and conquering the world. 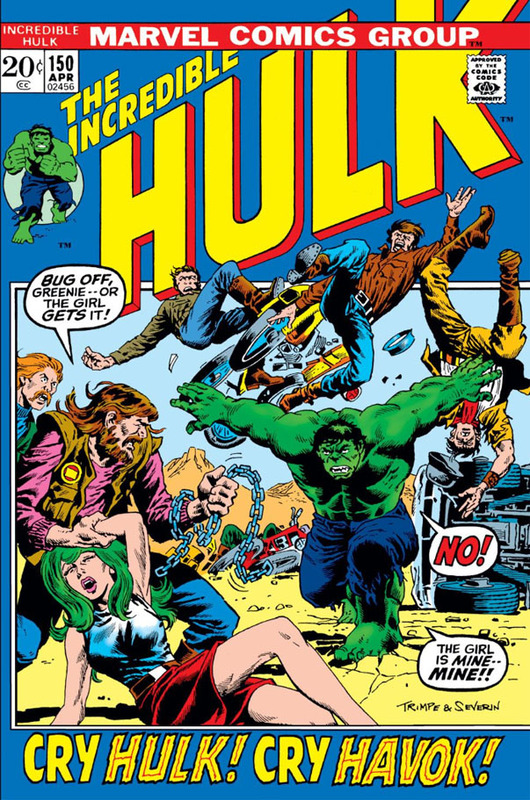 While a complete and separate story in its own right, the issue is something of a double-header that segues into the '76 Marvel Two-In-One Annual, with the Thing of course being the common denominator in both stories. Again, the time period of the 1940s doesn't exactly connect to the wave of the country's celebration of independence from Britain; rather, the story banks on the spirit of freedom, which was fought for with great vigor and sacrifice in the second world war, a conflict which dwarfed the war with the British. It's easy enough to grasp Thomas's thinking here, if mostly in a sales sense. 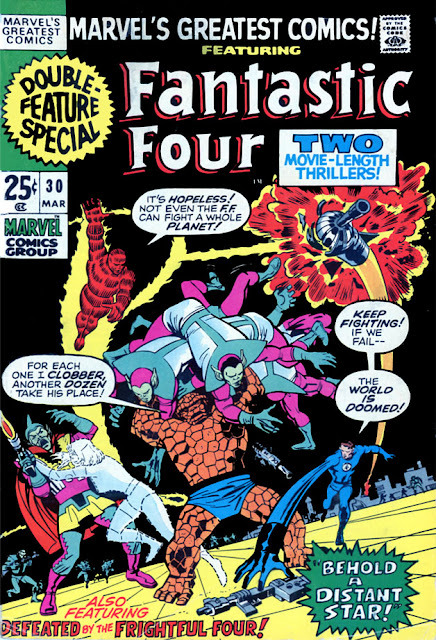 Thomas lays the groundwork for this story in the FF's regular title, when a skirmish with Luke Cage, under the influence of the Puppet Master, dislodges a canister of vibranium which falls onto the platform of the time machine Reed Richards duplicated from Dr. Doom's original design, sending it back into the past. 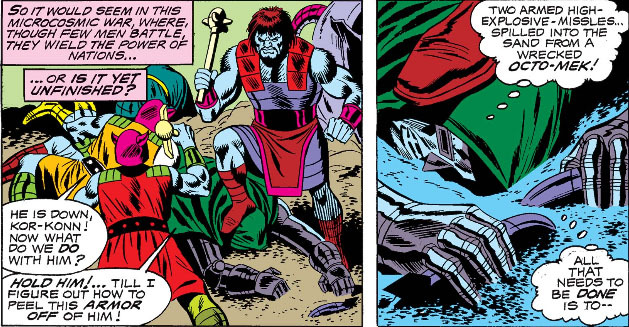 (Good job, Reed, in keeping the device on the power grid--heaven forbid somebody tripped while standing next to it.) The ramifications of the incident are realized when everyone enters the room of the unit to find unexpected guests, who tend to open fire on Americans on sight. The team starts putting two and two together and, to their horror, discover through a visual hookup scenes displayed through the years that show the Nazis taking over the world--and that the men they've captured travelled from 1946. 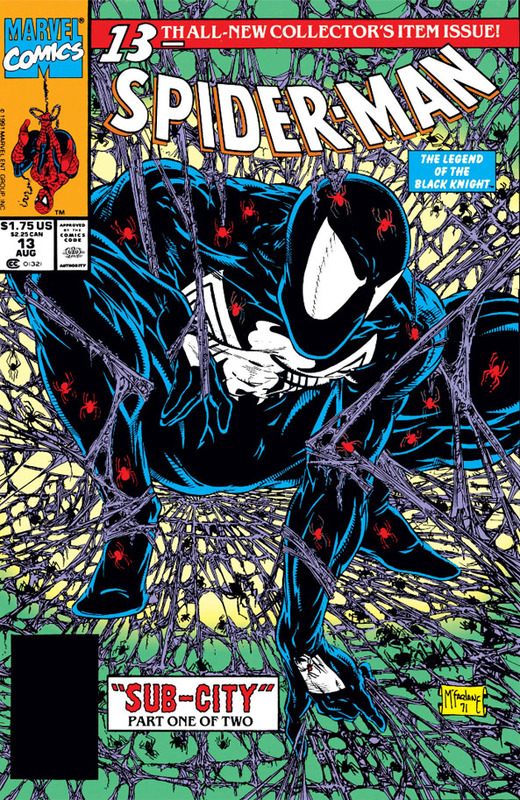 Yet Thomas turns the story into a virtual What If tale (the mag would debut in early 1977) by making it clear that this scenario occurred in another time continuum--a history that, if not corrected, could spread to other continuums, including the FF's Earth. That's a bit of a stretch; usually that kind of cascade effect requires some sort of rupture in space-time (if other such stories are any indication), and there's no evidence of that here. But in order for the FF to take action, their own history has to be unaltered at least for now--so the threat of a spreading alteration in history appears to be a plot device that Thomas finds necessary to establish for the story. At this point the reader's head is probably spinning as much as Ben's. 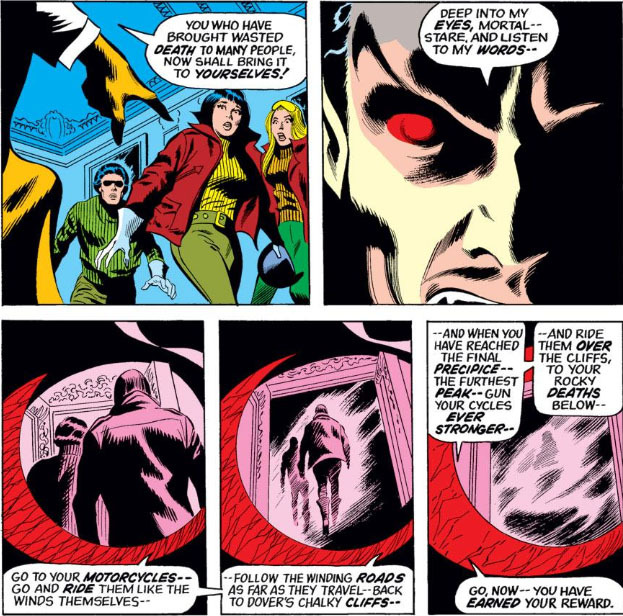 As for the Watcher, you can safely ignore his presence in this story, since it seems his purpose is mainly to point us in the direction of the MTIO issue at this story's end. 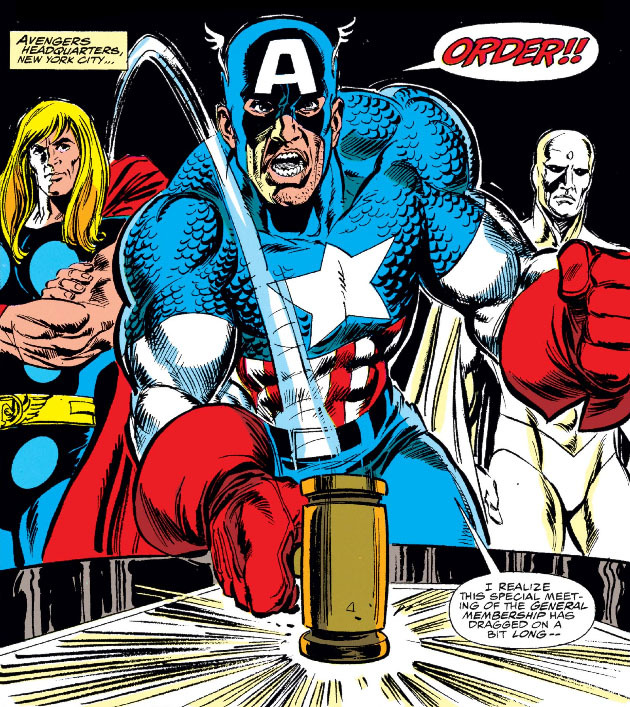 At any rate, the stakes are clear for the FF--and with Ben's offhand reference to the bicentennial, the team heads back to 1942 to prevent disaster. ...why the need to reach back to those books to market its newer product? The Battle For Three Worlds! The Prisoner And The Power! The Man And The God!